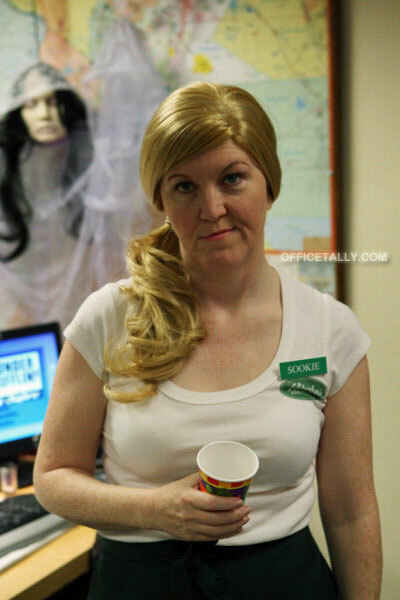 Here are photos from The Office episode Costume Contest, airing October 28, 2010. Is Ryan supposed to be Justin Bieber? If so, priceless! Love the True Blood costumes, but Gabe…wow. There are no words. Gabe, FTW! That is awesome!! And is Creed supposed to be something specific, or did he just grab dirty rags out of the garbage? I thought Andy Bernard as Bill Compton was the greatest thing I’d ever seen. … Ryan and Gabe posing together. Priceless. Yea looks great! hopefully they won’t cut this intro out of the Season 7 DVD package like they did in Season 6… still haven’t heard if they are gonna reimburse us somehow. As usual, Ryan Howard has his finger on the pulse of what the 13-year-olds are into. Oh man. Best. costumes. Ever!! Ryan as the Beibs, Gabe as Lady Gaga (!!) and my stomach is still hurting from Andy as Bill from True Blood. Love, love it! Kudos to the wardrobe department – you have outdone yourselves! I can’t get the image of Gabe out of my head. I just thank God he didn’t go for the meat dress. Oh wow. I am so excited for this episode! The costumes are fantastic. I can’t wait to see what Pam will be dressed as. She always has the best costume! Gabe as Jeffrey Starr? Hilarious. Ryan as Justin Bieber and Gabe as Gaga?! Fan-freaking-tastic!! I can’t wait to see this and see what Jim, Pam, Michael, and Dwight show up as! Anyone know who Erin is supposed to be?? who is meredith dressed as? i see the nametag “sookie”, but i don’t get the reference. and is oscar supposed to even be anything? @Katherine (#5) – that’s gabe as lady gaga. although i have to say, for a lady gaga outfit, that is incredibly tame. @Dallas (#8)- i don’t think they’re going to reimburse us. i don’t know why it was cut, but i think it has something to do with suicide groups getting uppity about michael’s “hanging”. Wow…guess I’m out of touch with pop culture! The only costume I recognized was Darryl! And Creed…assuming he’s just an unraveling mummy in dirty rags. Gabe’s is the best!! It’s one of the best thing his character has contributed so far! I can’t wait to see this episode. I agree with “Ungrateful Beeyotch”. Ryan will forever seem juvenile. @FlonkertonChamp (#14) she is dressed up as Sookie from TrueBlood and Andy is dressed up as Bill from that show also. I can’t wait to see what Jim comes up with and how much less effort he puts into it this year. He never disappoints. I wonder what the prize for this costume contest might be considering Stanley hardly puts any effort into his costume (unless he wants to sleep :P). It’s probably a day off…maybe a bonus? @Dallas, @FlonkertonChamp – If they cut out the cold open because it was offensive, then why did NBC allow it to air on the original air date? I know the executives from NBC even sit in on their table reads. Most things on The Office are offensive to someone somewhere, especially from Michael Scott. We should get to the bottom of this. It’s been a year now and still no definite answer. Suddenly I have so much love for Gabe. And I was pretty sure Ryan couldn’t top Edward Cullen. I am so glad I was wrong. There needs to be a Jersey Shore costume!! Listen, young ones, Gabe is Ziggy Stardust, not Lady Gaga. Gabe as Lady Gaga is EPIC! I saw a picture of Meredith dressed as Sookie with another costumed cast member (no spoilers) in her desk drawer on my set tour. Please, please, please before the show is cancelled, have Pam be 60’s TV-show Batgirl for Halloween. Oh man, can’t wait for this! So excited to see Jim’s costume and if he reaches a new level of minimal effort. It’s always the best! I think Gabe looks quite good as a woman! Is anybody as terrified of Gabe as Gaga as I am? Gabe looks creepy…and not in a good way. OH! The apple bob! I always wondered what that was in the new opening when Erin flicks her head up out of the bucket. It makes sense now. Gabe looks terrifying. who the heck is creed supposed to be? Oh, Gabe – wearing pants absolutely ruins the authenticity of a Gaga costume! Umm…I don’t think Gabe is Lady Gaga. Maybe they’ll bring it up in the episode where everyone assumes thats who he’s supposed to be, making him frustrated. Or you know, as frustrated as Gabe can be. To me (judging by the lightning bolt face paint) he looks like Ziggy Stardust, a persona of David Bowie. Can’t wait for a Halloween episode for The Office, hasn’t been one since season 2. Last two years they kept it in Cold Openings. Creed is the winner! The fact that his costume is kind of undefined makes it all the more creepy. Re: The great Gabe debate … I think he is Lady Gaga, as she’s been known to copy the Ziggy Stardust look–and has a feather-topped corset. Guys, why would Bowie be a relevant costume? Gabe is Gaga. HereComesTreble, Gaga used the same face paint. She’s a huge glam rock fan and has listed Bowie as one of her influences. But I think the most telling thing is that he’s wearing Gaga’s hair bow wig. I haven’t seen her with a lightning bolt face paint or a hairbow but yes it is more likely that Gabe is dressed like Lady Gaga. I’m most looking forward to Andy’s costume. He usually goes all out. Gabe is DEFINITELY Lady Gaga. I’m obsessed with the Lady and he is dressed as her, for sure. if you put your mouse over the image of Gabe it says in the hovering title: gabe lady gaga…. lol Ryan is Justin Bieber! Did not see that coming! LOL JK remember last year he was edward from twilight? Gabe is most definitely Gaga. The wig has a bow made of hair, just like a wig of Gaga’s. Google Lady Gaga and you’ll also see her with the blue paint under her eye, just like Gabe has. Why is Stanley a Samurai? It’s cool but I figured he be the one NOT to dress up. Shame that Oscar isn’t dressed up. I think Creed is a Mummy. Is Meredith dressed up as someone from Jersey shore? I like Darryl as Dracula! Episode was HILARIOUS. I hate Gabe but his costume made me LAUGH and still is! !